← DotNetFlume Client Pre-Release with Avro! Unit testing and TDD have become standard development practices for some time. Unit Testing helps build loosely coupled software and it verifies code is functioning correctly. Where it comes up short is verifying if the software being built actually satisfies the business goals. MSTest, NUnit and most other test frameworks can be used for testing high-level business processes. Unfortunately the tests are written in code with a programming language like C# that is not easily communicated with stakeholders making it difficult to verify if the software is achieving the business goals. Behavior Driven Design (BDD) attempts to solve this problem. Tests are written at a level business stakeholders can review and understand. Stakeholders, working with the development team write examples of how the software should behave and the examples are copied into code verbatim! The result is tests that match the business requirements because the business stakeholders wrote (or co-wrote) them. And the tests function as living documentation – the documentation does not go stale because the documentation is the tests and the tests can be run regularly as part of automated builds. This post focuses on SpecFlow. SpecFlow is one of the more popular BDD frameworks for .Net. Most importantly, for my needs it has integration with Visual Studio and MSTest and it looks like it easily integrates with my existing project. Merging users from one repository to my local database. Hitting Ctrl-S will save the Feature file and generate the MSTest stubs. The next step is to generate the Step Definitions which are invoked from the MSTest stubs. Right-click on the specification to select the Generate Step Definitions option. 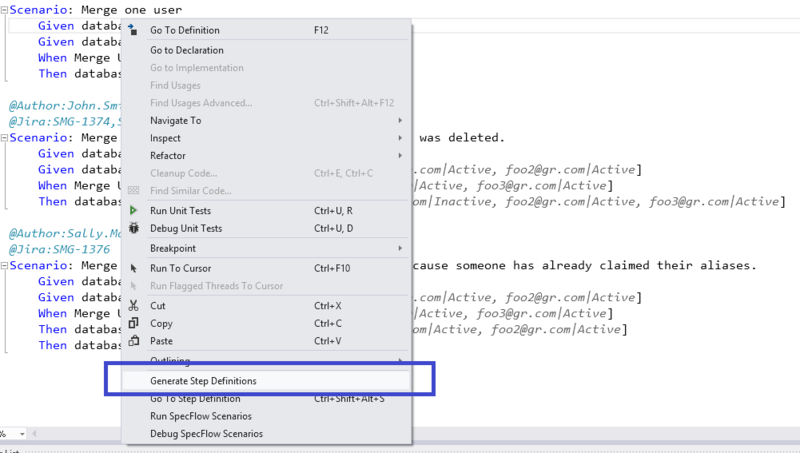 This generates the SpecFlow C# Binding where we map from the Specification to standard C# code. The SpecFlow tests can now be run like normal unit tests! 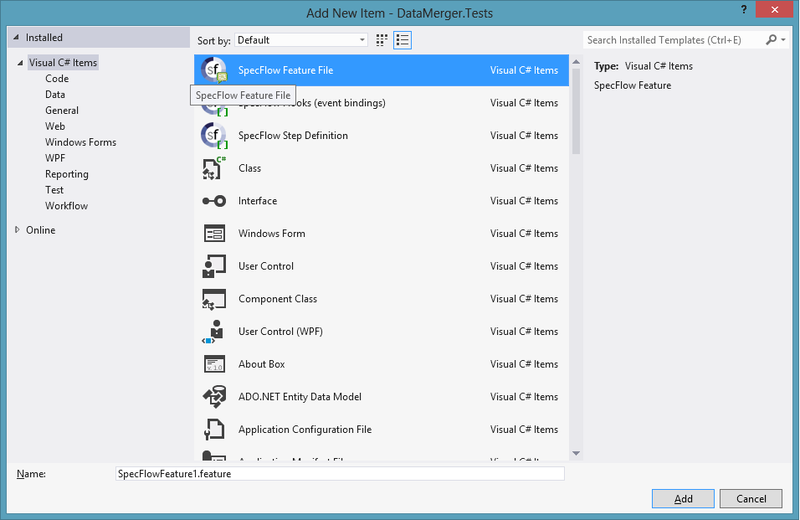 I would like to be able to add annotations to SpecFlow specifications and have it translate to C# Attributes on the generated test methods. Scenario: Merge one user alias. Deactivate an alias that was deleted. I want the generate coded to have my custom attribute like this. Out of the box Specflow only allows adding Tags to specifications. The Tags generate MSTest TestCategoryAttributes. By default, my Gherkin spec above generates the following code. Using reflection I could probably get the information I need from this implementation, but there should be a way to make it do exactly what I want. I see SpecFlow does have support for creating plugins. Unfortunately their documentation is somewhat lacking. Luckily, SpecFlow is open source and there are a few references out there such as this very helpful blog post – http://blog.jessehouwing.nl/2013/04/creating-custom-unit-test-generator.html. Next create a create a derived class of MSTest2010GeneratorProvider. The MSTest2010GeneratorProvider has a SetTestMethod to override. This seems like a logical place to add custom attributes to each of the test methods. My implementation searches for any Tags that start with Author or Jira for the given scenario. Then using CodeDom, I add my custom attribute to the code. I also remove the tags so that the base.SetTestMethod() call does not add TestCategoryAttribute’s to each of the methods. I need to add 2 public properties and logic in the Initialize and Cleanup methods. SpecFlow has SetTestClass and SetTestClassInitializeMethod methods to override, but there is no SetTestClassCleanupMethod. I found that for my needs it didn’t matter where I put the code generation logic, so I put it all in the SetTestClassInitializeMethod. The next step is to implement IGeneratorPlugin and register my custom unit test provider. The final step is to compile the assembly (hopefully it compiles) and place the libary in a patch accessible from SpecFlow. They are loaded from several locations. GeneratorPluginLoader.cs contains the logic for how SpecFlow loads plugins. I found the easiest place to put the plugin is in the /packages/SpecFlow.1.9.0\tools folder. Next time the Feature file is saved the code will be generated using the plugin! I’m interested to see how well SpecFlow works over an extended period of time. My hope is that it provides long term value to my project in the form of better documentation and more easily maintained tests. This entry was posted in .Net, C#, Unit Testing and tagged "Custom Attribute", BDD, Custom Plugin, Plugin, SpecFlow, SpecFlow Plugin. Bookmark the permalink. The section on Custom Attributes was awesome. I haven’t had a change to look into extending SpecFlow and your post sparked all kinds of things I would like to try. Thanks.